Class Motto: "Our hope is in the future; our faith is in the past"
I'm attaching the flyer being sent out to the Class of '57 regarding our summer picnic. We have this every year in the Newport News Park. This year it will be at Shelter #19 on June 7, 2008, 11:00 am until dark. If you could put this under "Dates to Remember" I would appreciate it. If any NNHS alumni would like to attend, please contact Nancy Timberlake Spencer or W. D. Dangler (numbers are on the flyer). There will be a charge of $12.00 per couple. 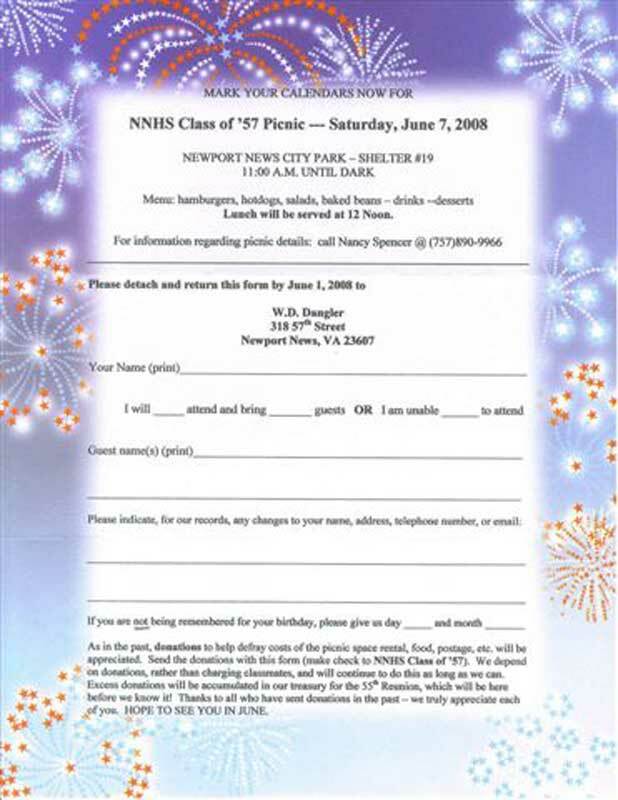 The NNHS Class of 1957 will hold its annual picnic at Newport News Park on Saturday, June 3, 2006. I have attended the last couple of their picnics and can assure you of a wonderful time. The Picnic will be held at the Newport News Park Shelter #19 on June 3, 2006, from 11:00 till dark. The menu includes homemade Bar-B-Q and all the other good fixins as well as specialty desserts made by members of the class. The picnic is NEXT weekend, Saturday, June 5, 2004, Shelter #18, NN City Park, 11 - until dark! All of you that have assignments (you know who you are) please be sure to bring the food item, drinks, ice, etc. or "White Elephant" auction items. As in the past, there will also be a "50-50" with half of the funds going to the class treasury. So far, reservations for the picnic have far exceeded expectations ... with 100+ indicating they will be there! JUST WONDERFUL news. I'm looking forward to seeing a lot of you and hope that everyone will enjoy himself or herself and have a great day creating new NNHS Class of '57 memories. Also - we will have our monthly dinner, AS SCHEDULED, on Wednesday, June 9, 2004, 6:00 p.m. at Angelo's on Route 17. We usually critique the picnic after-the-fact and discuss what things went right and what things we can improve on next year. 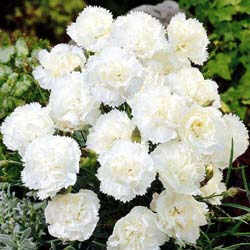 Later on, in July-August, we will gather pictures taken, etc. and have a new mail out of class information, along with the final invitation for the Christmas Gathering to be sent to all classmates. If any of you have a change of address, please notify me ASAP, so that my information can be updated before sending out to everyone. Thanks - in advance. We've signed the contract for the Christmas Gathering at the Omni Hotel for Wednesday, December 15, 2004 - PLEASE MARK YOUR CALENDARS ... no excuses! We have guaranteed, and must have at least 75 people to attend, to meet our contractual agreement. More details later with the invitation - but there will be a choice of chicken or beef again this year, @ $22.00/person including tax and gratuity; and anyone attending the function can reserve a room at the rate of $59/night. We've had such wonderful gatherings the past two years, I know this one will be equally great - we're very enthused about the venue change to a facility actually in Newport News, and the Omni is working very hard with us to accommodate our needs. If you've missed one of these - you've missed a wonderful time, and if you've been in the past - then I know we'll see you again. Remember to also keep obtaining auction items for the Christmas Gathering in mind and to seek out donations that can be bid on to bring money into our treasury for the 50th. Contact Richard Coltrane for information or to notify him of donations you've received. We so want the next Reunion to be a special event for all. We've gotten several great donations so far and hope to get many, many more. I hope that you are enjoying the summer, and do not live in one of the areas that has recently been hard-hit by the awful storms.